Developer Tools are required to obtain and use advanced components such as "make" and "gcc". You may use one of two options for installing these to your DV Server. The first requires access to the Account Center. The second requires SSH access to your DV. Please see the instructions below. The steps below detail how to install additional packages on your server using the Account Center installer. From the Overview panel, Click on the Admin button for the DV you wish to install developer tools on. 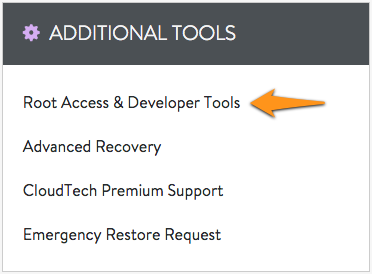 Select Root Access & Developer Tools from the Additional Tools panel. Scroll down to the Developer Tools section and click Install. To install additional packages on your server, you may use the "yum" package installer. It is an easy way to install packages from third-party repositories. There is a convenient meta-package called "Development Tools" which will allow you to obtain the tools with a single command. You will see text scroll by as the server determines what packages need to be installed. A base install should output the following packages to be installed/updated. Enter "Y" for yes when prompted. At this time, all the packages will be downloaded and installed. There is no need to reboot your server. All changes are made live. Please take note of any warnings displayed and act accordingly. Developer Tools are required to obtain and use advanced components such as "make" and "gcc". Please follow these simple steps to add these to your (ve) Server. Please note: The installation instructions vary by OS in some cases. Before beginning, you'll want to identify your OS and then find it in the list below. When running CentOS or Fedora, "yum" is one way to install packages from third-party repositories. There is a convenient meta-package called "Development Tools" which allows you to obtain the tools with a single command. When running Debian or Ubuntu, "apt-get" is one way to install packages from third-party repositories. There is a convenient meta-package called "build-essential" that will install the Developer Tools with a single command. Need to get 15.8MB of archives. After this operation, 51.3MB of additional disk space will be used.